The grantor must sign the quitclaim deed in the presence of two credible witnesses. The quitclaim deed must also be subscribed by the two witnesses. The address of the grantee is needed in order to record this type of real estate document. 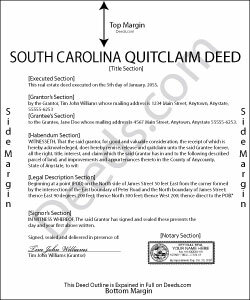 The Registrar of Deeds does not require a derivation clause to be on a quitclaim deed in South Carolina. The Uniform Recognition of Acknowledgement Act must be complied with, the details of which are described in 30-5-30. For information on the content and format of a quitclaim deed, visit the county links listed under South Carolina. A quitclaim deed of conveyance of lands is valid to subsequent creditors or purchasers for valuable consideration without notice, only after it is recorded in the office of the register of deeds in the county where the property is located. In the case of a subsequent purchaser of real estate (or a subsequent lien creditor on real estate) for valuable consideration without notice, the instrument evidencing the subsequent conveyance or lien must be filed for record in order for its holder to claim under section 30-7-10 of the South Carolina Code as a subsequent creditor or purchaser for value without notice, and the priority is determined by the time of filing for record. Darrell P. said: My legal description exceeds the avaiable space in the one page Exhibit A...any way to add a second page as 'Exhibit A (continued)'? Reply from Staff: It is not required to use the included exhibit page. Simply label your printed legal description as the appropriate exhibit.